Award winning journalist Christopher Bryson talks about his groundbreaking book: The Fluoride Deception . Video is approximately 30 minutes long. 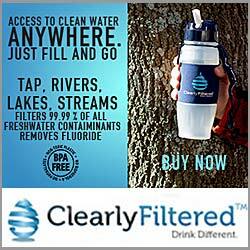 Get the ABSOLUTE LATEST in Water Purification Technology. ClearlyFiltered products ELIMINATE up to 99.99% of the Bad Stuff in your water, including Fluoride, Chlorine, Bacteria & Heavy Metals. Please take a moment and make a generous contribution.